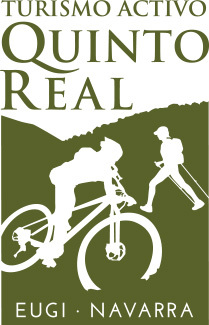 Hotel Quinto Real offers different types of outdoor activities and active tourism in the Eugui area, just 27 km from Pamplona in Navarra. The mountains that surround Eugui are perfect for actuve tourism, an environment that encompasses nature, history and fun, you will see spectacular landscapes, can enjoy a specific fauna and flora of our area, as well as one of the most important beech forests of Navarre. If you want to spend one or several days of sport in contact with nature, we will make it easy, with activities for all levels, from walks around Eugui to longer routes through the immensity of Quinto Real. We offer you the service of a local guide, our international guide of the lower mountains will accompany you at all times, while you enjoy healthy excercise and learn about the area. In addition we provide logistical services for moutain biking and cycling, with vehicles to take you further, a map of the area and personalized advice. You choose what you want to do. We don’t set limits. We’re here help you: Just contact is without any commitment. Afterwards you can stay in our hotel or eat a typical Navarrese menu in our restaurant.